Fred Coker (NEU / NUT): “David, what made you get so involved with the electoral process this year? ”I was 18 at the time of the 2006 Presidential election. After the results came through, it became clear to me, and millions of others, that the corruption was so deep, that the PRI were capable of ‘buying the election,’ that the whole electoral process was a fraud. I lost all faith in our ability to bring about social change through the vote. So in 2012, I took no part at all. Half a million people came to the city to protest the vote last time. But over the past few years, with the blatant corruption under President Peña Nieto, the public response eg. to the kidnapping of ‘the 43’ from Ayotzinapa, and with the creation of Morena and their taking a very strong anti-corruption platform, once again I felt ‘hope.’ I decided to get involved in the movement for change. The Mexican nation again took to the polls on Sunday 1 July, with over 3000 posts, from the President, to Senators, Judges, and local councillors being up for election, the most extensive in the country’s history. To fully appreciate the importance of this event, one must appreciate some of the challenges that the country, its people and its political representatives are facing. “Elections in Mexico have traditionally been little more than a pantomime, providing the veneer of democratic legitimacy that the Institutional Revolutionary Party (PRI) needs to maintain its nakedly corrupt, 71-year stranglehold over the country. The Mexican political system has decades of experience of simulation,” RUCD founder and UNAM law professor John Ackerman told me* during one of our briefings on 29 June. In each of the Mexican presidential elections of 2006 and 2012, there was pretty much universal acceptance of widespread electoral fraud, whose effect in the first instance was to ensure the continuity in power of the incumbent PRI candidate. The tragic consequences for the people of this diverse nation of 125 million citizens, was the loss of faith in the democratic process, and a loss of hope – ‘esperanza’ – that the corruption plaguing the country had any sign of being defeated in the near future. This was the backdrop against which this Spring, the call went out from the London-based human rights organization, Justice Mexico Now, and Mexican activists ‘Scholars and Citizen Network for Democracy’ (RUCD), for a small army of 700 international, and huge army of up to 24,000 national volunteer election observers to be recruited to monitor, in as widespread a geographical manner as possible, the forthcoming Mexican electoral process and the 1 July vote. “Out of concern about the precarious state of democracy in Mexico and the low credibility of the country´s electoral institutions, an international group of scholars, journalists, activists, and artists have decided to create an International Network of scholars and Citizens for Democracy in Mexico.” International observers from Britain and elsewhere would be joining their ranks for this election. but it is one’s life that defines ones consciousness. As a recently retired member of the National Education Union, and a teacher of 25 years working across primary, secondary and special education, I was lucky enough to have my application to participate as an International Observer accepted. I had some familiarity with the current political situation in Mexico, having been a member, in Manchester, of a group who campaigned, since September 2014, to raise public awareness around the abduction and disappearance of 43 student teachers from Ayotzinapa in the Mexican state of Guerrero. Alejandra Jara Vazquez, of the Manchester for Ayotzinapa group, accompanied me on our visit to the ’43 monument’, and to the Families of the 43 encampment in Mexico City. This is the camp used by the families of the abducted student teachers when they carry out activities in the capital city. A mix of corrupt local politicians, law enforcement officers and drug cartels seemed to work in collusion to eliminate these young students who had a reputation for being vocal opponents of the government and its policies attacking public education. To date, the families of the 43 have seen no coherent nor conclusive investigation as to these young men’s fate, nor have those responsible been brought to justice. I had also worked with my Armadillo Productions partner, Ana Lucía Cuevas, over 4 years, on a documentary film investigating the disappearance and murder of political activists and whole indigenous communities in Mexico’s neighbour, Guatemala. Since 1954, whole communities and progressive organisations in Guatemala have fought for the restoration of a truly representative democratic process, one that had been undermined under the auspices of the post-WW2 USA ‘new world order’, serving the narrow economic and military interests of the Guatemalan ruling elite, backed by the U.S. Central Intelligence Agency. (See The Echo of Pain of the Many https://vimeo.com/37979362 . It is too easy for someone, in eg. Europe and North America, where news of events in Latin America is often limited to that of natural disasters or the exploits of professional footballers, to read any political commentary without a ‘numbed sensitivity’, fostered by years of Latin America being represented with stereotypical views of ‘underdevelopment,’ and its presumed consequences. However, as a teacher in Britain for over 25 years, one would encourage students of Latin America, in particular, and other so-called ‘developing nations or regions,’ to investigate further the causes of this poverty, corruption and subsequent underdevelopment. That analysis can only take place, in part, with an appreciation of Mexico’s particular predicament of lying immediately across the border from a super-power which chooses to order and organise the world according to its own national interests. 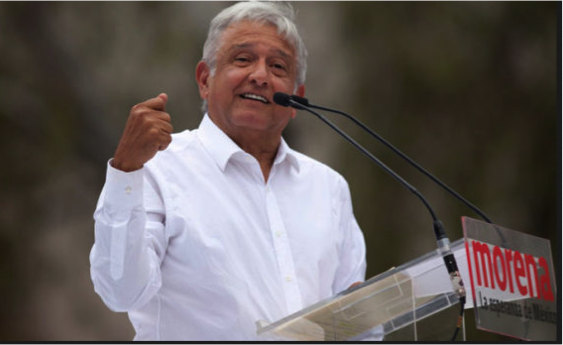 This issue was addressed by the the Morena party candidate for President, Andres Miquel Lopez Obralon, colloquially known as Amlo, who sought election on a surge of discontent with the established Mexican political parties. He has promised to "put Trump in his place," and made Mexican economic and political sovereignty a cornerstone of his campaign. Having been successful in my application to become an International Observer, I received, in advance, useful guidance from my teachers’ union here (NEU), and extensive background information and voting process guidelines from Mexico’s electoral commission, the INE. I, personally, felt that until I arrived in Mexico, I could not grasp the true seriousness or volatility of the current situation, and the extent to which ‘ the stakes were high.’ I expected that that would become pretty quickly obvious after, hopefully, meeting Mexican and, perhaps, international teacher colleagues in a few hours’ or days’ time. In the first instance, however, I had yet to even meet more than 2 members of the British ‘delegation,’ and that was only briefly en route and prior to an uncomfortable 12-hour flight from London Heathrow. Nigel Yeo (centre) and Jenny Christopher (on the right), both of Oldham NUT and with whom I'd travelled from London, meeting with NEU International Secretary, Christine Blower, in the famous Sanborns restaurant, on our arrival in Mexico City. My first opportunity to meet the whole group was to be at a ‘reception’ in an upstairs conference – dining room at Sanborns restaurant , based in the famous Casa de los Azulejos, or ‘House of tiles, an eighteenth century palace located in Mexico City’s ‘Centro Historico’. I’d been there no longer than an hour, mixing and chatting, enquiring about people’s work and lives, when I soon came to realise the wealth of knowledge and experience that had been assembled for the task in which I was about to take part. I felt a bit like a ‘seasoned’ footballer, who had just been brought into a successful squad of international players, not just other teachers, as I had previously understood, but Latin American specialist academics, human rights defenders, journalists, respected trade union organisers and educationalists with decades of service and experience. I felt privileged, at this point in my ‘career,’ to be amongst such talent, and relished the opportunity to be part of the upcoming challenges ‘the team’ were about to face. I was looking forward, in particular, to meeting Carlos Cruz. I had been given notice that we would be working together as part of Brigade 10, one of the teams that would be visiting and monitoring voting stations on Election Day, Sunday 1 July. I had ‘Googled’ his name, and found he was doing really interesting language work with migrants in London, as part of the Unite trades union. I dug a little deeper, and found a letter he had posted trying to recruit new arrivals into London to his classes and activities. I was struck how the language he used in his ‘flyer’ was simple, clear, and in particular, welcoming to anyone whom otherwise might feel hesitant to expose their lack of language native to the country that had recently, for any number of ‘difficult’ reasons, now become their home. Carlos, himself, had 21 years ago been forced to leave his native Columbia because of his political activism, having to leave his wife and children behind whilst he found a safe and secure place to which he could bring them. In his case, that became London, and it is where he set up the United Migrant Workers Education Project . For these efforts and other committed work, he had won the 2014 Latin American Citizen of the Year award. As we shook hands, I sensed straightaway a quiet determination and seriousness in his demeanour. He, like the other 25 or 30 ‘delegates’ now seated round tables where smiling waitresses in traditional Mexican dress were taking orders for drinks, was here ‘to work.’ The call had gone out for a team of International Observers to be assembled to play a small but important part in Sunday’s elections, and despite a bit of travel weariness and jet lag, Carlos embodied the spirit of the group as a whole. He was warm, committed to the task, focused. We were welcomed on the evening of our arrival by Francisco Cobos (RUCD - Red Universitaria y Ciudadana por la Democracia) who greeted our group as part of the extensive network of International Observers. He underlined the importance for all Mexicans that people had travelled from all over the world to help ensure that the democratic will of the Mexican people would, this time, be truly honoured, and that hope in the democratic process would be restored across all sections of society. He also explained that on the previous two days in Mexico City, many other teams had received training as we soon would, and that they had already departed the capital for locations across the country in anticipation of Sunday’s vote. The following day RUCD had our organised 5-6 hours of training, going over all the forms we were required to complete, either during observations at each of the Casillas (voting stations), or as part of the summarising of our findings, and reporting them back for central data collection at specific intervals on Sunday’s voting day. What became apparent to delegates, if it had not already been, that tremendous efforts and resources had been organised, principally by Mexican volunteers, to ensure as much as possible that our participation would be very structured, efficient, and make a real contribution to the overall transparency of the electoral process. International Observer Brigade No.10 member, Carlos Cruz, interviews party representatives observing the voting at ‘Casillas’ Modelo de Bienestar Social, Mexico City, as to their views on the fairness of the process they had been observing all day. I thought to myself, what message would it give to ordinary voters, knowing how corruption and fraud had ruled the day during preceding elections, that volunteers were travelling from all over the world to scrutinise the legitimacy of their vote? Our role was a serious one, and one that we came to feel was appreciated by all those voters we met at the voting stations over the course of our subsequent observations on election day. I mentioned to a volunteer working at the Casillas at Mercado Carmen Reyes in Mexico City, that in Britain, when voting in eg. a national election, registered voters receive in the post a card with our name and polling station printed on it, which we present at the polling station, receive ballot papers, go mark our electoral choice, put the ballot in the box, and then leave. Jardín de Niños John Dewey, Tlalnepantla. Each of these was a conscious ‘interaction’ between local members of a particular community, each performing or engaging in a process that sought to ensure ‘fairness’, and in so doing, restore faith in this important electoral process. This procedure was overseen, in each and every case, by the ‘reps,’ ie. the representatives from any of the 9 official parties who had candidates standing in an election for a post to represent the neighbourhood served by a particular ‘casillas,’ or polling station. Political party representatives overseeing the electoral process at Jardin de Niños John Dewey, Tlalnepantla de Baz, Estado de Mexico, north of Mexico City. As I mentioned earlier, I was part of Brigada 10, along with Colombian-born and London-based UNITE trades union educationalist, Carlos Cruz, and we were joined on the day by Mexican volunteer David Gonzalez Islas, a Masters degree student studying bio-fuels. We had, over the course of the day to this point, visited 5 different voting stations one in ‘Estado de Mexico’, north of the capital, and another 4 in Mexico City. What was immediately apparent from our first stop at 7 a.m., was that while casting one’s vote was an ‘individual act,’ the voting process as a whole was definitely a family and community affair. Some voting stations were held in local schools, others were in outdoor markets, and some were even set up in private homes where a suitable community venue didn’t exist to service the voting requirements of a particular group of neighbourhoods. A voting station could be made up of one or more ‘casillas,’ each of those being limited to no more than 750 registered voters. This enabled electoral volunteers to carefully monitor and scrutinise the process and the participation of a discrete and limited number of voters. Just five minutes before voting stations closed at 6pm, we arrived at our last destination, the Escuela Secundaria 7 José Manuel Ramos. It was a barren and cold building of concrete block construction, whose entrance ‘foyer’ was filled with bags of cement, signalling the intent, at some future point, to re-build or re-furbish its uninspiring interior. What was immediately visibly obvious, and you could feel it in the air, was the intensity of focus amongst all the young volunteers whose job it was to ensure, once the last votes had been cast, that they were correctly counted, double-checked under the scrutiny of party representatives still in attendance, and that the results were recorded and posted on large A1-sized sheets on the exterior walls of the school for the whole neighbourhood to see. An electoral commission (INE) representative re-iterates to local volunteers the procedures for the beginning of the ‘count’. She, and the other volunteers who had worked the whole day monitoring the vote, were still being ‘overseen’ by representatives of the competing political parties, now behind the closed and locked doors to the voting station at Escuela Secundaria 7 JMR. A second thing that was immediately obvious, as it had been throughout the day, was the preponderance amongst electoral volunteers of young women 20-30 years old. Presumably they had, as had my ‘Brigade partner and local volunteer David,’ decided this was an election with which they wished to be deeply engaged, one that could have a real bearing on social transformation, and the establishment of a new, just and democratic process across Mexico. Once recorded, the voting papers themselves were to be sealed in large plastic cases, and then sent off to a larger secure storage along with the votes from other nearby localities. As the votes were being counted, there was, again, a quiet yet palpable energy, enthusiasm and air of optimism being shared across the otherwise cold, damp interior of this old school building. It was clear to us as International Observers, that the predominant support amongst those gathered here was for the Morena party candidates, and that they were clearly in the lead across all the races for President, judges, and local councillors. 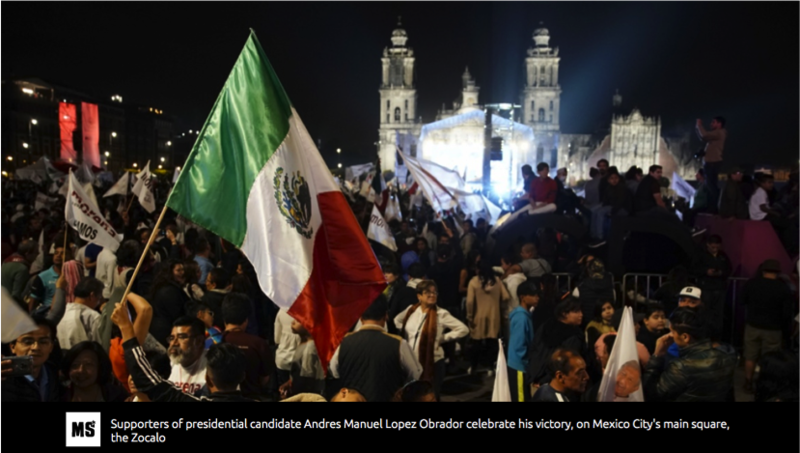 By 9 pm, reports were being shared across social media that two of the main right-wing candidates for President had already conceded victory to Andres Manuel Lopez Obrador, the Morena party candidate . David Gonzalez Islas, our International Observer partner, was now in such a state of excitement, he could neither stand nor sit. He felt, probably like millions of other young Mexicans who for years had been dismayed by the corruption at all levels of Mexican society, that this election and its results now signalled a return to hope… ‘esperanza’. David was now like a volcano ready to explode. The earth was rumbling, and smoke and ash were being thrown into the air foretelling the imminent and explosive conclusion to the evening. It was now 11.15 pm. We had been up since 5 a.m. in order to be off to observe at our first of six casillas. The votes had been counted and double-checked. All the results were duly recorded by this local army of young women, diligent to the end in their task to be accurate in each of their respective responsibilities. And finally, the large A1-sized public reporting sheets came out and the summaries for all of the elections were recorded and ready for public scrutiny on the outside walls of the school. Lopez Obrador, referred to as AMLO, the left-leaning former Mexico City mayor, had run, amongst other issues, on eg. an anti-corruption platform, and universal access to college. He had won the electoral race by a 23 percent margin, taking in 53 percent of the popular vote, while his closest opponent, center-right Ricardo Anaya, garnered 30 percentage points. Outside the voting stations closed doors, you could begin to hear crowds chanting, car horns beeping. David dropped Carlos and I back at our hotel, as we were desperate for a meal and some sleep. He, on the other hand, was on his way to party, to celebrate, to help collectively tear the skin off the old corrupt reptile, the Partido Revolucionario Institucional, and to look forward to the hope of a future with justice, and the possibility that democracy might flourish in their beloved Mexico. It was an incredible privilege for me, and for all of the 27 or so International Observers with whom I travelled from Britain this past summer, to witness this incredible explosion of the democratic process in Mexico. We were a diverse group of teachers, trades union activists and officers, Latin America specialist academics, and human rights defenders who had set off to try, with 700 other International Observers, to play a small part in scrutinising the election in Mexico. We joined forces with over 24,000 Mexican volunteers who invested their time, energies, and an inestimable amount of hope that a fair and just democratic process could be delivered, that the voice of the Mexican people could be heard and recorded. We should never take for granted any of the democratic principles and practices we enjoy in our country, notwithstanding the need to constantly fight to ensure that these are not eroded by narrow political or economic interests who would seek to advance their own self-interests over that of the majority. The Mexican people have delivered an example of democracy to be admired. The challenge will now be how the new promise can translate into a new reality. I spoke to a lot of Mexican people – in restaurants, on buses, working as street vendors or as domestics in our hotel, in the airport ‘Duty Free’ - in the days immediately following the election, and asked their feelings as to the result. Generally, there was, after the euphoria of election night, a quiet, almost guarded optimism, yet still a sincere ‘hope’ for their future, and that of their children. My own feeling, expressed back to them, is that the hope unleashed by the Morena party candidates, that which had inspired so many young people to get actively engaged in the election process, had now to be sustained. They could not rely on democracy and change to be delivered from the ‘top down.’ They, as members of civil society organisations and campaigns, as politically active members of their local communities, had to stay involved, and continue to make their demands, their vision for the future remain in the public focus and discourse. his hope that the new administration under the leadership of Amlo, and now with a majority control of the Mexican legislature, “would have the political will to address the [many] underlying problems of Mexican society… and that the human rights abuses, corruption and violence” endemic in the country could only be addressed if the political will of the nation’s new leadership was reinforced by the continuous engagement of ‘plural civil society,’ to ensure that the aspirations inherent in this national elections could begin to be addressed. Our hopes are with them, as are our thanks for letting us participate. Report submitted by Fred Coker, National Education Union (NUT Tameside branch), with many thanks to all those who contributed to the above.